Very Rev. 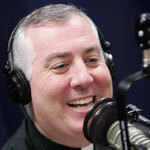 Mark O’Connell was ordained in 1990 as a priest of the Archdiocese of Boston. He is a graduate of Boston College, Saint John Seminary in Brighton, and of the Pontifical University of the Holy Cross in Rome. He holds a Doctoral Degree in Canon Law. He currently works in the Archdiocese as the Judicial Vicar and at Saint John Seminary as an adjunct faculty member. The power of this station 1060 AM leaves much to be desired. Is there a fix on the horizon? Jerry, as you’ve noticed, the power of the station is somewhat reduced at night. This is required by FCC regulations. Nevertheless The Station of the Cross network tells us that they are constantly working to improve the transmission of 1060’s signal across the broadcast area. We appreciate your patience. In the meantime, if you can’t hear a particular broadcast via radio, you will be able to download every show after it’s broadcast in addition to listening live online.